German immigrants who arrived in the 1800s were largely responsible for the development of Mazatlan into a thriving seaport. Among other things, the German settlers established the Pacifico Brewery and influenced the local musical style known as banda. Mazatlan was the hometown of Pedro Infante. Born in 1917, Infante became one of the most famous actors and singers of the Golden Age of Mexican cinema. His untimely death in 1957 was the result of a plane crash. Mazatlan's Malecon is the longest malecon in the world. This promenade runs along the beaches for nearly 13 miles. Mazatlan claims to be the shrimp capital of the world. Whether this is true or not, shrimp abound in Mazatlan and are well represented on the menus of the local restaurants. Of all the cities on Mexico's Pacific coast, Mazatlan is the most active in regards to art, culture, and entertainment. Found on the Pacific coast approximately 670 miles northwest of Mexico City in the state of Sinaloa, Mazatlan used to have an image as a spring break party haven. That image has largely been shed in recent years. Today, Mazatlan Mexico caters more to families and retirees. This resort city also attracts plenty of package tourists who are interested in the overall affordability of Mazatlan travel. Sure, you can find world-class golf in Mazatlan, as well as a luxury-yacht harbor, but even these things are highly accessible to visitors who don't have a huge travel budget. No introduction to Mazatlan would be complete without also mentioning the cliff divers. Near the lighthouse shore, the famous divers of Mazatlan leap off high rocks into the ocean below, earning tips from onlooking tourists. Pictured in the interactive photo above is a famous Mazatlan cliff divers' platform. Tourism is one of the main industries in Mazatlan Mexico. This is largely due to the resort city's ample gold sand beaches. Arguably the best of the bunch is Playa Sabalo, or Playa Camaron Sabalo, as it is also known. 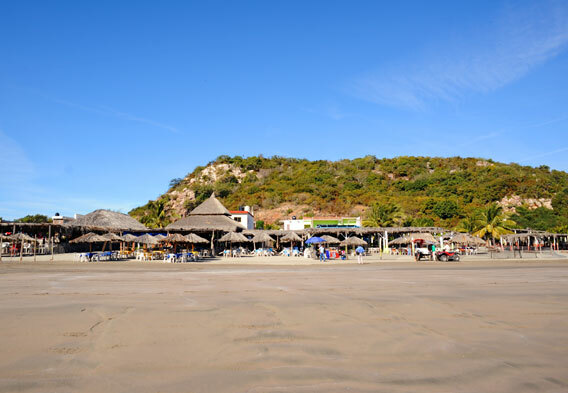 You can find this beach just north of another renowned Mazatlan beach - Playa las Gaviotas. Both of these beaches are in the hotel zone and feature water sports concessions. The main difference is that Playa Sabalo is larger than Playa las Gaviotas and has more room to stretch out. If surfing is your thing, you can often find good waves at Playa Sabalo and Playa las Gaviotas. Los Pinos Beach, known to surfers as "the Cannon," is also a Mazatlan surfing hot spot and can be found north of the old Spanish fort. The surfing swells in Mazatlan are most consistent from May to September, and there are local operations that rent surfing equipment and offer surf camps and lessons. When Mazatlan visitors aren't relaxing or enjoying water sports activities on the mainland beaches, they can venture out to the nearby islands for an enticing day on the sand. One such island is Stone Island. Known in Spanish as Isla de la Piedra, Stone Island isn't actually an island. Instead, it is a peninsula. Due to its island feel, however, it is commonly referred to as a separate entity from the mainland. Either way, this is the most popular "island" to visit among Mazatlan tourists. Awaiting visitors on Stone Island are a rustic little village and pale sand beaches that are bordered by coconut groves. These beaches stretch for miles and feature palapa restaurants. On Sunday afternoons, the palapa restaurants offer music and dancing and have little trouble attracting Mexicans and foreigners alike. It's just a short ferry ride from Mazatlan to Stone Island, and a day excursion is very much encouraged during a Mazatlan vacation. Sure, the beaches are the main attraction in Mazatlan Mexico. That being said, visitors shouldn't spend all of their time on the sand. In the city, a wonderful assortment of attractions and cultural events help to make Mazatlan a multi-layered travel destination. The Old Town district in particular is especially interesting, due to its beautiful old buildings and colorful town houses. Wrought iron and carved stone lend to the beauty of the Old Mazatlan structures. 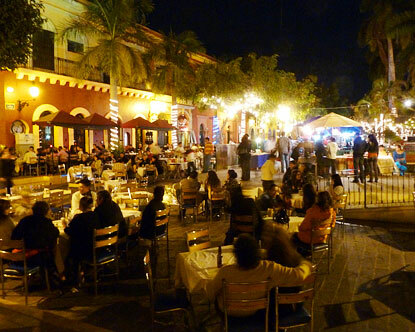 Old Town Mazatlan is also where you will find Plaza Machado, or Machado Square. On weekends, the streets that surround this small square are closed to cars. This allows musicians, vendors, artists, and street performers to move in and set up shop. The beach hotels in Mazatlan stretch from the downtown area to the north. Major areas to find them include the Zona Dorada (Golden Zone), Playa Norte (North Beach), Nuevo Mazatlan (New Mazatlan), and the downtown/Playa Olas Altas area. The farther north you go, the higher the rates tend to be. The Zona Dorada is on the more northerly side and features some of the most deluxe Mazatlan beach hotels. Playa Norte is situated between the Zona Dorada and downtown Mazatlan and is the city's original tourist hotel zone. Across from the beach at Playa Norte are moderately priced hotels and motels. In the more immediate downtown area, a picturesque beach is just a short walk from the downtown core. This old section is where movie stars from the 1960s and 70s came for some fun in the sun, and many of the hotels from that era are still in business. 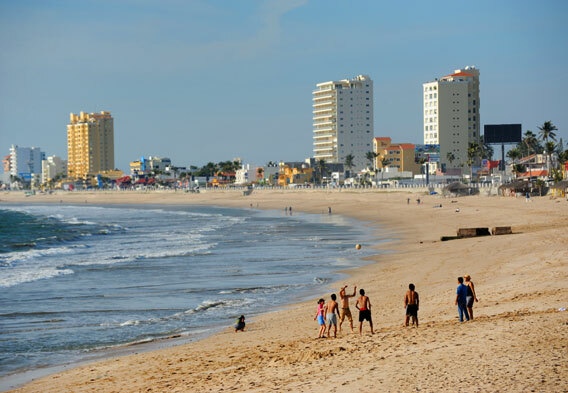 As for the Nuevo Mazatlan district, it runs north out of the marina and is about a half-hour drive from the city center. 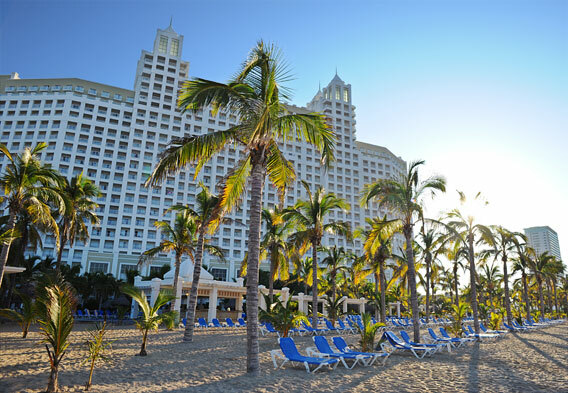 The newest development area of Mazatlan, it features such hotels as the Pueblo Bonito Emerald Bay, the Crowne Plaza Mazatlan, and the all-inclusive RIU Resort Emerald Bay (pictured). As a side note, many of Mazatlan hotels cut their prices from May through September.